As part of my ongoing quest for mental health I've been working on an art journal. Creativity is always a good thing and it seems to help me process things a bit better. 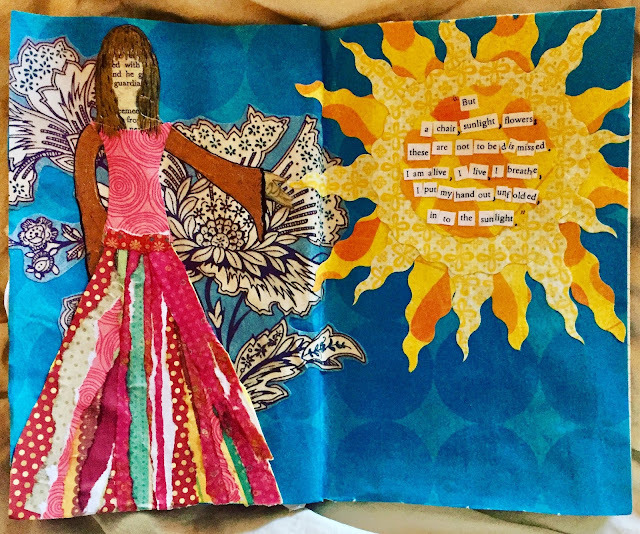 I'm no genius when it comes to being creative but that is the great thing about an art journal... it doesn't have to be perfect or even GOOD... it just needs to be an outlet. I really enjoy doing it. I force myself to squash the self-criticism and over judgmental thoughts I have and just enjoy the process. I recently finished re-reading The Handmaid's Tale by Margaret Atwood. I'm very excited to watch the TV version coming out in the near future. It is a fantastic book so if you haven't already read it, do so immediately. The main character is going through truly horrendous circumstances but she forces herself to appreciate the tiny bit of sunlight in her life. It is beautiful and it reminds me to do the same - to reach my hand out into the sunlight and appreciate the gift that it is. I strive to appreciate the good in my days and allow those moments to lift me up. That's just good advice for everyone. My most favorite. For reals.